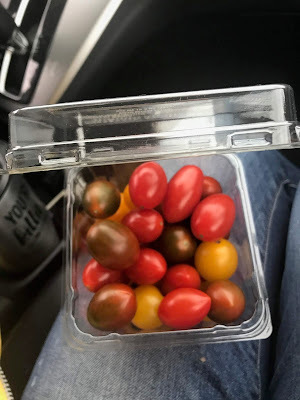 Bonni Brodnick Blog : I Say "Tomato," You Say "Listeria Monocytogenes"
I Say "Tomato," You Say "Listeria Monocytogenes"
My daughter (the doctor-to-be) drove us up to the Vineyard. As we were driving, I pulled out the tomatoes I brought as a pre-repast at Wendy's. "Would you like a tomato?" I asked. I popped one in my mouth. I rolled a third one around in my mouth before biting into it. So delectable! "You should have washed them," my daughter said. "Did you know that there could be Listeria Monocytogenes on them?" "Nooo, but ..." I spit that third one out into my hand. "Or Salmonella? They could also be covered in Shigella. You really shouldn't eat them, Mom, before washing them." "I'm not," I said, trying to wipe off the seeded goo from my chin. "Good," she continued. "Because you wouldn't want a case of Campylobacter Jejuni either." Med school, it appeared, was paying off.